NEW YORK, NY--(Marketwired - May 5, 2015) - Terraboost Media®, the inventor of billboard style hand-sanitizing dispensers, has doubled its network in just over 12 months and today announced its latest plans to install dispensers at top grocery chains in the Northeast. More than 3,700 dispensers will be installed at Stop & Shop, Giant Food and Martin's Food Stores adding to existing locations including Safeway, Rite Aid, Price Chopper, Roundy's, Simon Malls and more. With its growing network of now more than 55,000 dispensers, Terraboost reaches more than two billion consumers per month across the United States. Terraboost Media has a variety of display/dispenser models to meet the needs of various retail locations including grocery stores, drug stores, malls, and airports. 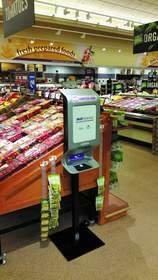 In grocery locations, up to five dispensers are installed throughout the store. Hand-sanitizing wipes can be found at the entrance to the store where customers can wipe down hands and carts; other dispensers with hand-sanitizing foam can be placed in the meat, pharmacy and produce departments -- areas of the store where sanitizer usefulness is at its highest. The five- to six-foot-tall dispensers have a large, eye-level billboard display where advertisers can deliver a localized or national brand message to consumers. Terraboost has a roster of over 1,500 advertisers nationwide with more than half of the brands comprised of health and wellness advertisers such as hospitals, health insurance brands, and urgent care companies as well as a large roster of consumer packaged goods advertisers. As a turnkey solution for retailers, Terraboost Media secures all billboard advertisers and completely manages the maintenance of the hand-sanitizing dispensers. "We're very pleased to add these latest retail locations to our rapidly growing network, which now delivers wellness and communication directly into the hands of more than two billion consumers per month in the United States -- this is 18 times greater than the reach of the Super Bowl audience," said Brian Morrison, CEO of Terraboost Media. "We view our solution as a win-win-win: hygienic shopping experience for the consumer; an engaging and proven advertising vehicle for our media partners; and cost-saving, turnkey solution for the retailer." Terraboost Media®, founded in 2007, is a Miami, Fla.-based advertising company with regional offices in Chicago, New York and San Francisco, operating a media network of more than 55,000 patented hand sanitizing billboards in all major markets throughout the United States. Terraboost has six models of its dispensers to accommodate diverse high-traffic consumer locations including grocery stores, malls, specialty retail, airports and drug stores and feature both digital and static billboards. With significant reach and critical mass of over 30 billion consumer impressions per year, Terraboost has created a powerful place-based advertising network.